Longrain restaurant specialises in South East Asian sharing dishes, boasting fresh ingredients and twists on popular dishes. It was also close to the Sheraton, where we were staying, so we popped in for dinner. I’ll come clean; I wasn’t sure about Longrain when we walked past it. It looked too stuffy and polished and seemed like the place business people would go. But we were cold (Melbourne, I don’t have the right clothes with me for your topsy-turvy weather!) and peckish and couldn’t be bothered to walk back to the restaurants we’d already gone past. Inside, it was stuffy and polished and full of business people. There were many suits and shirts around. It wasn’t my kind of place. It was also quite cold. However, looking at the menu always cheers me up and even though we’d just come from a month in Indonesia and Singapore, I never lose my appetite for Asian food. As we are known for over-ordering, we went straight for mains. I chose Coconut poached chicken with green papaya and Vietnamese mint in coconut milk (I can never resist anything with coconut milk in) and Tom chose Stir fried pork belly with cuttlefish and asparagus. A side of greens made its way onto our order, as did a portion of brown rice (for me) and white (for Tom). For drinks, Tom attempted to make his way through their local beer whilst I settled for a non-alcoholic cocktail stuffed with lychee and raspberry. Our big mistake came when our hungry little bellies got the better of us and we got food envy. The table next to us had some giant round mound that was neatly captured in a net. Funnily enough, it was called Egg Net and was a signature dish. That was added to our order after our waiter convinced us to try it. If only we’d waited a few more minutes… our food started arriving and it was huge. It was also delicious. The coconut chicken was creamy, aromatic and slightly sweet. The greens were fresh and crunchy. The egg net contained a wild mix of pork, prawns, peanuts and caramelised coconut which spilled out onto our plates. The pork, whilst tender, was my least favourite – it was too rich for me. The EggNet – the dish that tipped us over the edge from ‘just right’ to ‘must roll home’. This was pretty close to food heaven – we were in dire need of fresh veg (tick) and hearty yet light food (tick). For me, personally, I’d have been happy with just the coconut chicken, greens and rice. The rest were just bonus dishes. Service was decent, with some good beer recommendations for Tom, although we felt we were slightly misled on the size of the dishes (I ended up taking it home and having it for dinner the next day which I’m not complaining about). We did have a slight situation when a little caterpillar floated from the bottom of my glass and hovered about on the surface. They were quick to replace this but it took a fair amount of poking around before I was convinced none of his friends were swimming around. The food was delicious and portions generous and despite the caterpillar situation, I’d happily go there again. But I’d keep my dishes to a minimum! 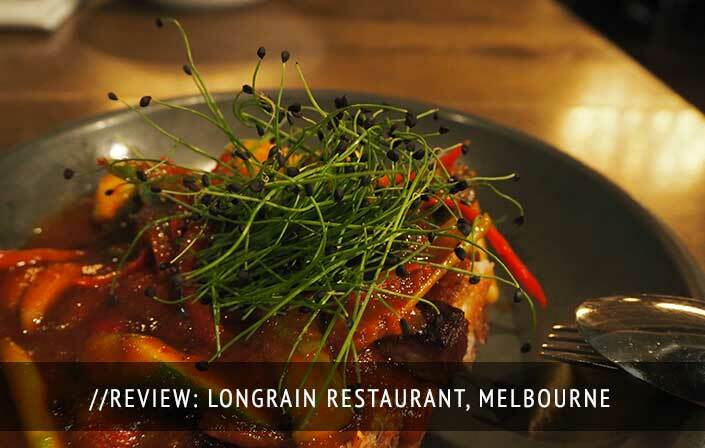 Longrain also has a restaurant in Sydney. Total bill came to AUS$170.